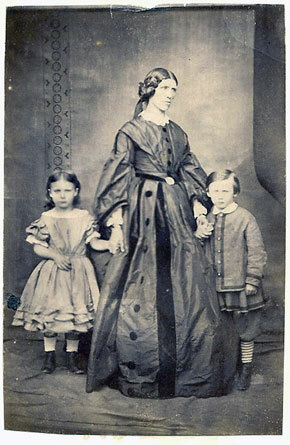 The inscription on the rear of this photograph reads 'Mrs Broderick of Summer Lodge aged 44 years and her twin children Edward and Elizabeth aged 5 years - taken by William Sunter of Gunnerside 1863 for James Woodward'. This is Ann Broderick (née Lonsdale), born about 1819 in Healaugh and married to Edward Broderick, eleven years her senior. 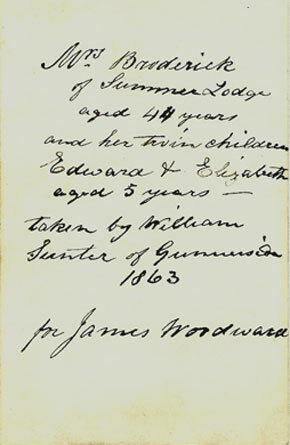 Ann and Edward farmed 220 acres at Summer Lodge and had at least eight children. In a will dated April 1872, a few months before her death, Ann left land and property at Healaugh to four daughters.